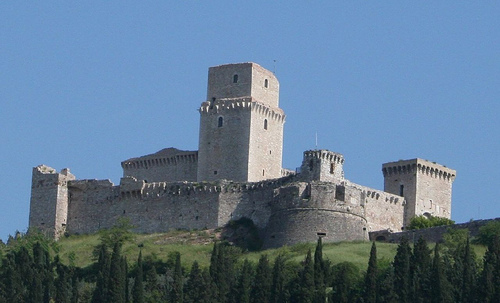 The day we decided to hike to the very top, to the Rocca Maggiore fortress, it was raining. Yet, the view was worth it, especially as a heavy fog rolled in from the valley devouring the town. Watching one big church after another disappear in a mist so thick as to be tangible, I was reminded of the old tales of Brigadoon (that, and of a Stephen King novel, the Mist). In this spiritual retreat centre of central Italy, three days with three very different characters served once again to remind me of the mystery and awe of God’s handiwork! We spent the afternoon revisiting the shops to pick up souvenirs, and drying off in a Café just across form San Rufino Cathedral (also recommended by Rick Steves’). Unfortunately for me (or for my family, I guess), my memory of where I saw the gifts I wanted to get for some of my family did not serve, so I had to leave some places empty handed. We did find a place selling a local cheese made with black and white truffles, and fresh pasta, which we put together for dinner. Delicious! Such a pity Nancy left the cheese here when she left for home! Only 3500 people live within the walls of the historic town, though 25,000 within the city limits which mostly sprawl on the valley below. For this small number, there are almost 100 churches. Ok so some of these have been deconsecrated, but still, for that number of Catholics in the U.S., one church the size of any of the basilicas would be more than sufficient! This could explain why you see sparse numbers at mass sometimes, is that there are too many options! 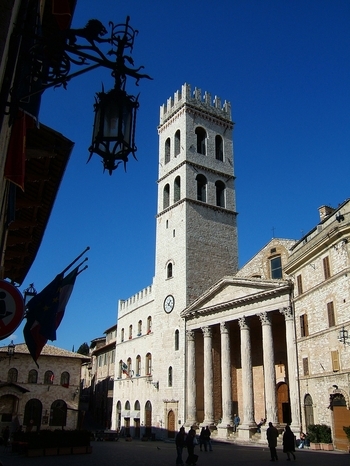 However, sparse numbers was not a problem in Assisi’s cathedral on a Tuesday afternoon. We had about half an hour to kill before the shuttle picked us up, and as I may have mentioned, it was raining. So we ducked inside the Cathedral thinking we could sit and pray or look at the artwork in relative comfort. The place was packed! But not a car in the piazza, which had been full on Sunday! Imagine a few hundred teens, a dozen Franciscan friars, and a Charismatic praise and worship service. And they say there is no life in the church here! By A.J. Boyd in La vita Roma on January 5, 2010 .